Earlier it was known as Purig ~ now in news and apt to be remembered by the entire Nation today – 26th July 2017. Starting in 1590, the Gyalpo of Leh extended his control over Western Tibet. Between 1640–1675, Purig came under the control of his grandson Bde-ldan-rnam-rgyal, along with Zanskar and other parts of the modern Ladakh Division. Centuries later, in 1822, Raja Gulab Singh of the Dogra dynasty was anointed as the Raja of Jammu by the Sikh emperor Ranjit Singh. In 1834, Gulab Singh sent his general Zorawar Singh Kahluria to conquer the territory between Jammu and the Tibetan border. Marching through Kishtwar, Zorawar Singh reached Purig and defeated the Bhotia leader Mangal at Sankoo in August. Kartse, the then capital of Purig, fell into Zorawar Singh's hands, who built a fort there before advancing towards Leh. Following the First Anglo-Sikh War and the Treaty of Amritsar (1846), Gulab Singh was made an independent Maharaja of Jammu and Kashmir. The princely state of Jammu and Kashmir, as it eventually came to be called, was organised into two large provinces, Jammu and Kashmir, and two frontier ilaqas, Ladakh and Gilgit. Ladakh was a wazarat (district) with a governor called wazir-e-wazarat. It had three tehsils: Leh, Kargil and Skardu. Initially, the Wazir used to spend four months each at Leh, Kargil and Skardu. But shifting the entire staff so often proved too exhausting and, so, the shifting was eventually limited to Leh and Skardu. The city of Kargil always had a tehsil headquarters. Now getting back to that article in Quint on Deepchand Prakhyat : On 5 May 1999, a few shepherds had reported spotting Pakistani infiltrators in Baltik. Armed with 120 mm motors, Deepchand and his troop marched to fight the enemy that had entered the Indian side of Line of Control (LoC) . “We carried heavy arms and ammunition on our shoulders. We fired and moved with them on difficult mountainous terrain. At certain points the cliffs were almost perpendicular,” he said. We didn’t crave food. We wanted bullets. My fellow soldiers and I would ask the person who got us rations to bring us more ammunition instead. In a war, you don’t feel hungry. For soldiers, nation comes first. We didn’t have mobile phones then. The only point of contact with the outside world was the Vividh Bharti. I remember listening to their special program for the army brethren. How heroic and one really would like to fall at the feet of this great hero ! Eighteen years ago, on July 26, India emerged victorious in the Kargil conflict with Pakistan. 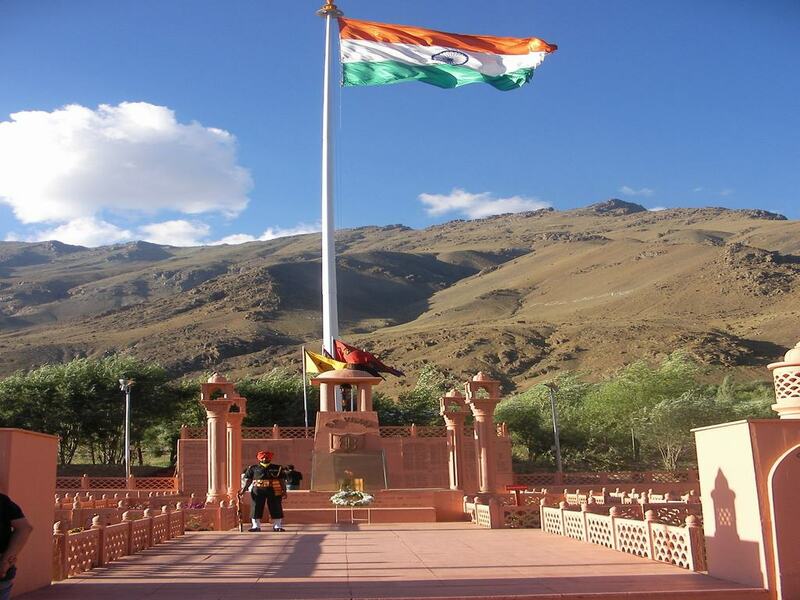 In order to commemorate India’s win in the war, the Kargil Vijay Diwas is celebrated every year. Operation Vijay was launched by Indian Army to flush out the intruders. More than 10,000 soldiers and officers of the Bihar Regiment were deployed to the war front. In a well planned operation in the Batalik Sector, soldiers of 1 Bihar, in a fierce fight with the Pakistan Army, captured Point 4268 and Jubar Ridge on night 06/7 July 1999. 7 July 1999 is a red letter day in the history of the regiment, as the Jawans of the Bihar Regiment pushed back intruders from Jubar Hills and point 4268 in Kuker Thang area in Batalik sector. During the war, the Indian Army evicted Pakistani intruders and succeeded in recapturing the Tiger Hill and other posts as a part of Operation Vijay. The conflict had gained a lot of attention because of the India-Pakistan relations post 1971 war. In addition, the rough terrain and high altitude Himalayan regions made the war more difficult. While PM Narendra Modi hailed the bravery of the armed forces and said the day reminds us of India’s military prowess, Defence Minister Arun Jaitley paid tributes to martyrs at the Amar Jawan Jyoti in New Delhi on Wednesday. Army Chief General Bipin Rawat, Navy Chief Admiral Sunil Lanba and Air Force Chief Marshal B.S. Dhanoa accompanied Jaitley. More : Deepchand Prakhyat was a six feet tall, lanky fellow. In the accident, he lost his right arm and both his legs. Before the accident, he represented Haryana in the 100 metre race. This warrior feels proud of having done his duty and the Nation owes him greatest respect. More from Indian Express - As India is celebrating Kargil Vijay Diwas, its has been learned that Pakistan Prime Minister Nawaz Sharif and former Army chief General Pervez Musharraf had a narrow escape on June 24, 1999. Indian Air Force Jaguar had targeted Gulteri base and Sharif and Musharraf were present there at that time, according to Indian Express report. The pilot of the Jaguar was supposed to drop the bomb but chose not to fire it at the military base, the report says. An official document accessed by IE, noted that On 24 June 1999, Jaguar CLDS [Cockpit Laser Designation System] engaged Point 4388. The document also said the pilot had lased over Gulteri across LoC but the bomb did not reach the target as it was released outside the laser basket. Later, it was ascertained that the PM of Pakistan, Mr Nawaz Sharif, was present at Gulteri when the target was attacked, according to IE report. The Jaguar that targeted Gulteri base, was not aware of Sharif and Musharraf’s presence. An Air Commodore, who was airborne at the same time, however, advised the pilot to not fire at the bomb. The bomb was then dropped on the Indian side of the LoC. Gulteri, also called Gultari, a forward administrative base of the Pakistan Army, was at the forefront of providing logistics support to Pakistani soldiers during the Kargil War. History could have been far different ! Jai Hind, Jai Jawan ~ long live our brave soldiers. Pic credit : Wikipedia commons.